For other ships of the same name, see HMS Raider. HMS Raider (P275) is an Archer class patrol and training vessel of the British Royal Navy, used to fulfil the sea-training syllabus of the Cambridge University Royal Naval Unit (CURNU). Based in Ipswich, HMS Raider is used to conduct sea-training at weekends during term-time; travelling to ports on the east coast and on the continent. During the Easter and summer vacations, HMS Raider is deployed for up to 6 weeks of sea time. Students undergo shore-based training at weekly drill-nights held in Town Headquarters (THQ) in Cambridge. Sea-training takes place on HMS Raider at weekends during term time and on vacation deployments. Students also have opportunities to spend time on larger Royal Navy warships and naval bases, to participate in adventurous training and to gain RYA qualifications. Cambridge URNU is affiliated with the town of Harwich, the Trafalgar-class SSN, HMS Torbay and 815 Naval Air Squadron (NAS) based at RNAS Yeovilton in Somerset. 815 NAS provides fast, agile Lynx helicopters for the Royal Navy, and is the largest helicopter squadron in the world, as well as one the oldest squadrons of the Fleet Air Arm. The Squadron operates the Mk3 and, in increasing numbers, the Mk 8 Westland Lynx. Students get regular opportunities to visit and spend time with these affiliated units. Cambridge URNU, despite the name, serves and represents the University of East Anglia in Norwich as well as the Cambridge-based universities, Anglia Ruskin University and the University of Cambridge. Other URNUs similarly recruit from one or more universities. 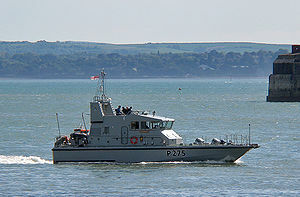 HMS Raider is one of sixteen 20 metre, 54 tonne P2000 patrol craft employed by the Royal Navy. She is constructed from glass-reinforced plastic (GRP). All sixteen P2000s fall within the 1PBS, with fourteen of these being affiliated with URNUs. 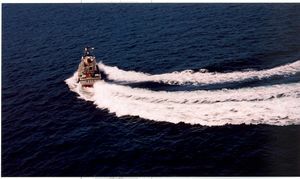 As a Batch 2, HMS Raider has a sustainable top speed of 24 knots, but can exceed this given suitable sea conditions. Faster than her Batch 1 sister ships, HMS Raider's more powerful supercharged MTU diesels give the Cambridge URNU the ability to travel further afield when on deployments and sea-weekends. 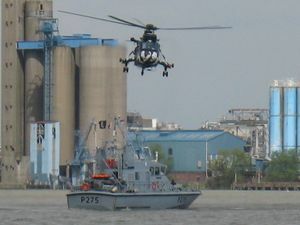 The only other Batch 2 P2000 is HMS Tracker (P274) which is affiliated to Oxford URNU. In addition to her Captain, HMS Raider has a permanent crew of four Royal Navy regulars and one Reserve Officer. When deployed, up to twelve students may be embarked in addition to one of CURNU's four Training Officers (TOs). All TOs are Lieutenants or Sub Lieutenants in the Royal Naval Reserve, with the most senior taking the title of Senior Training Officer (STO). Students in CURNU hold the rank of honorary Midshipmen and are paid at standard Navy rates. This page was last edited on 5 August 2010, at 23:03.